Sometimes I'm amazed at how many country estates exist in the greater Boston area. 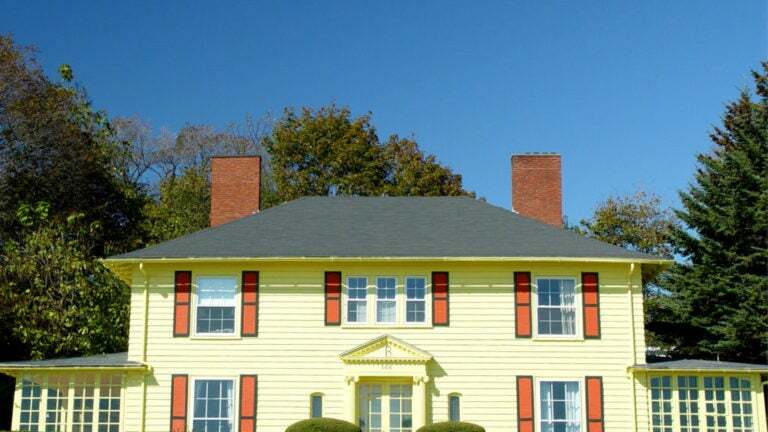 Many communities to the north, south, and west are home to large houses surrounded by acres and acres of land, many of them having been built in the early 20th century. The house I'm talking about today is a great example. 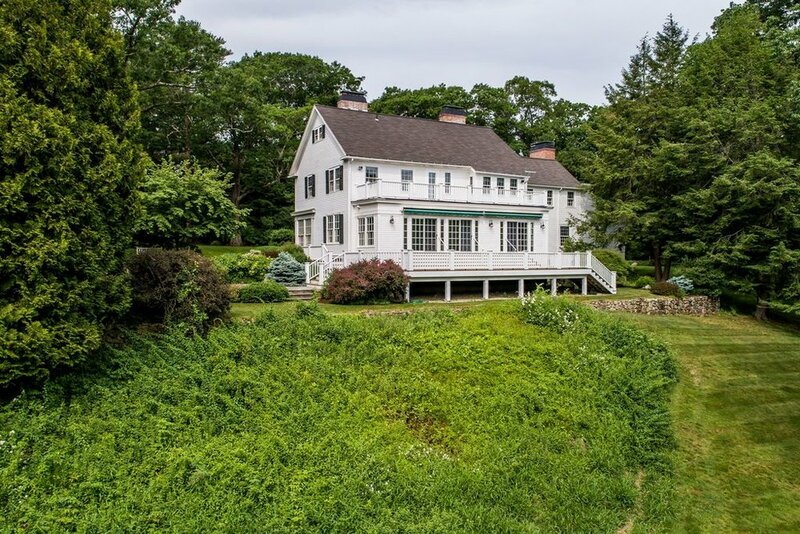 Sitting on 10-plus acres in Topsfield, this c. 1900 Ipswich River watershed estate is exactly the type of house I picture when I imagine a New England summer home. Most people's minds would probably take them to the Cape or somewhere closer to the beach, but for me, this countryside setting with a huge yard, multiple gardens, and access to the river is my idea of a summertime retreat! Just looking at the exterior of the house makes me feel relaxed and stress-free. As much as I love the outside, I really fell for the inside of this house because it features one of my absolute favorite design details: brick floors. Brick is a wonderful material to use as flooring because it adds texture and warmth in place of plain hardwood or tile flooring. I think brick flooring is gaining in popularity because so many people are trying to achieve modern farmhouse style now, but it still feels unexpected when I see it. It's a great option for mudrooms and laundry rooms, but in this house, it was used in the entryway, sitting area, and dining room. It runs the whole length of the front of the house! These rooms feel both cozy and cool to me. Imagine opening all of those windows to let a sea breeze blow through the house in the summertime! In the fall and winter, a roaring fire would warm guests at the dining table and make this small sitting room feel nice and toasty. Brick was also used in this bedroom to create a small archway leading to a window seat. I'd love to curl up with a book in this spot! Notice how there appears to be three different types of brick used here—two different types on the arch and wall, and a third type around the firebox opening. Perhaps this was an original exterior wall at one point? Many of the rooms have fireplaces, and abundant windows fill the rooms with natural light. There's also plenty of built-in storage. And then there's the backyard, which is never-ending. Small patios and walkways lead to different areas of the yard and connect grassy swaths of land to nicely tended gardens. This view from the deck overlooks two small terraces and a tiny outbuilding in the distance. The walkway leads to a pond and small sitting area. This would be such a peaceful place to enjoy a cup of coffee in the morning or unwind after a long day at the office. I'm not sure what this small outbuilding is used for, but I'd like to imagine that it would make a great writing or artist's studio, or even a potting shed. With so many inviting areas both inside and out, this property makes the concept of indoor-outdoor living in New England look effortless and appealing. This would no doubt be a magical place to live. For more photos of the home, check out the listing. All photos shown here are from the listing. The real estate listings in Westwood show that some beautiful historic properties are on the market right now. Here's another gem from the early 1700s known as Fox Hill Farm. Fox Hill Street in Westwood has some gorgeous homes on it, and this one is no exception. As charming as the house is, it's the land that I find myself taken with. It is summer, after all, so my mind is in outdoor entertainment mode. Every stone patio looks like the perfect place to set up a grill and sip a cold beverage, and every lawn looks like the perfect place to run around with the dog, play frisbee, and enjoy the sunshine. This property has room to do all of that and more! This view certainly illustrates the romantic locale. The gravel path leads to an 8-stall horse barn situated behind the house. I love the weathered shingles on the barn's exterior and the brick wall that continues along the terrace. Can you imagine hosting a Kentucky Derby party here? I'm already planning it in my head. The moss between the flagstones makes me feel like this place should be in the English countryside! This arched gateway appears to be formed by old trees, perfectly framing the view of the apple orchard. These photos were obviously taken during different seasons, but look how lush the orchard is in the warmer months. The inside of the house is expansive. The early American-style fireplace in the dining room has an extra-deep hearth. There are many other instances of exposed brick throughout the house, along with several fireplaces. The fireplace in the room below is tiny, but the brick surround and angled door make up for in character what the fireplace lacks in size. This house looks like a fabulous place to throw a summer soirée or two. Just add a few sets of string lights around the terrace, scatter around some potted flowers, stock the bar, and send out the invites. I doubt many people would decline the chance to relax in this idyllic setting! To see more photos of the home and to learn more about the property, visit the listing. All photos shown here are from the listing.